This is a detail of a painting/collage I did quite a few years ago. I use older newspaper for the background on many of my paintings. I was tearing up a newspaper from 1940 and on the opposite side found this story. I quickly pasted it down and then made the painting based on the story. Hundreds of Christmas shoppers along the Champs Elysees Saturday saw a well dressed man holding an umbrella standing against a cafe window. A passerby was puzzled by the man's unflinching posture. 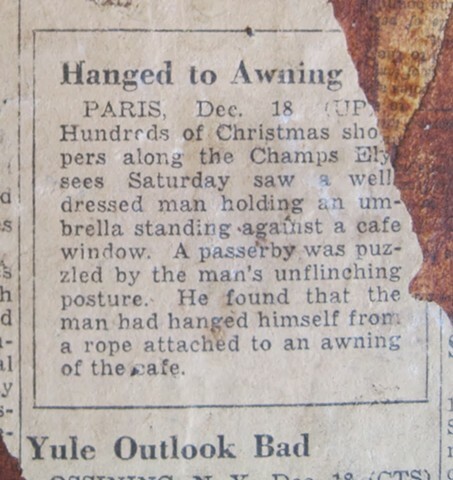 He found that the man has hanged himself from a rope attached to an awning of the cafe.